Laid down, 15 May 1944, at Defoe Shipbuilding Corp., Bay City, MI. 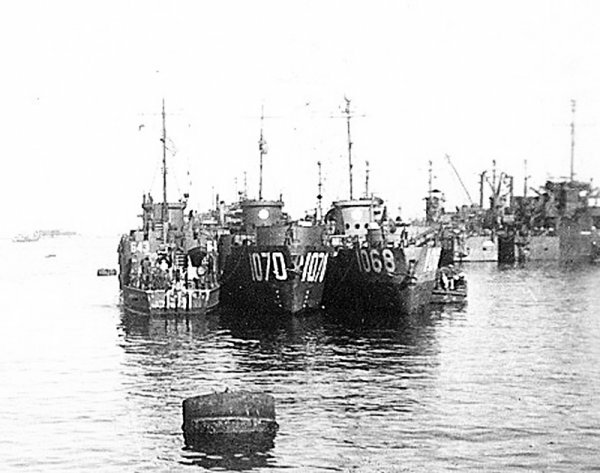 55k From left to right; USS LCI(R)-643, USS LCI(R)-1070 and USS LCI(R)-1068) moored in a nest at Okinawa, probably in April 1945. Photo taken from USS LCI(R)-785. The family of Leonard Lyn Greisz, EM2/c, USS LCI(R)-785.